I set out to find a productive app this week. Truly I did. Though there were a couple of worthy candidates (the lively note taking app mem:0 and the resume creating app resume designer both warrant a look), one app peaked my interest more than any other this week, and kept me from being productive entirely. In the spirit of trying to bring the best of the best in apps then, I’ve got to tell you about “Tiny Token Empires”. 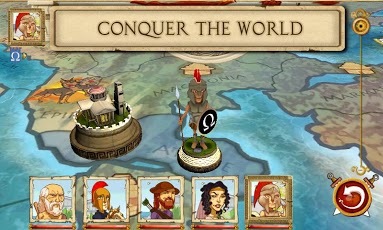 If you’ve ever played “Puzzle Quest” or its sequel, you’ve already got an idea of what to expect from “Empires.” The difference is that while “Puzzle Quest” was an RPG that used matching puzzles in place of traditional combat, “Empires” is a world conquest sim with a similar puzzle battle formula. You’d expect the world sim aspect to be the focus of this game then to separate itself, but you’d be wrong. That part is essentially an extremely watered down version of the “Civilization” games, as you build your resources and expand your empire by conquering the towns of nearby nations. While elements of that series like unit types, special characters and troop movements are present in “Empires,” all political aspects, or anything unrelated to military movements are not. It’s a simplified style that only works as well as it does by playing second to what is an excellent puzzle system. Whenever combat is initiated, whether it be with rival armies or mythical creatures, a puzzle board is shown with all units involved displayed on both sides. To attack, you have to combine three of the same puzzle tiles (think “Bejeweled”) that match the color of one of your units. Defeat all enemy units, and victory is yours. The combat element adds an incredibly welcome depth to the otherwise standard system, as you’ll have to always consider the colors you need, as well as your opponent to attempt to counter their best attacks. Similarly, getting the right combo chain can turn the tide of the battle entirely, as the right one can win you a battle instantly, or lose you everything. It brings an element of urgency to an otherwise casual game, and ironically leads to more strategy than the strategy element. Like so many other noteworthy gaming apps, where “Empires” stands out is its style. Don’t be turned off by the cartoon looks, as they’re just used to enhance the game’s tongue-in-cheek approach to history. It’s not the type of humor that’ll have you laughing out loud, but it makes the game feel lively and spirited helping to combat the redundancy even the best of mobile games can fall victim too. “Empires” is just the perfect example of a mobile gaming experience. At its heart it’s a pick up and play anytime puzzle game that everyone should have one of on their device, but the combat and five unique strategy campaigns, along with the well implemented art style, give it the kind longevity and depth not usually present in puzzle games. It all leads to a game that’s hard to put down, and impossible to forget. “Tiny Token Empires” didn’t exactly invent its core concept, but it does execute it in a way that stands out from anything of its kind, and provides your next mobile game addiction without apology. So join me and put productivity off until next week (maybe) by trying “Tiny Token Empires,” my app of the week. I tried to find a reason to not put “Temple Run 2” as the app of the week. I wanted to find some obscure, must have gem that was released in the same week as one of the biggest app sequels of all time instead, and hope to help it find some time to share in “Temple Run 2’s” considerable spotlight. Try as I might though, it was still “Temple Run 2” that came on top of the heap. I probably don’t need to elaborate on the concept of “Temple Run” as with 170 million plus downloads, there’s a good chance you’ve played or heard about it. But just for forms sake, “Temple Run 2” has you playing as an adventurer in pursuit of the golden idol. The actual acquiring of it is never an issue, but the escape from the temple is the real challenge, and this is where the player comes in as they try to escape the temple, and it’s fervent defenders, via a series of course changes, jumps, and other simple (but rapid) interactions, all while trying to collect coins to unlock all kinds of goodies. You can’t survive, but the fun is in how long you last, and how much you can collect. Since it’s a clearly successful formula, “Temple Run 2” doesn’t find much cause for altering it. Instead, this is a “more is better” type sequel, though that doesn’t mean there aren’t noteworthy additions. A particular highlight of “Temple Run 2” is the graphics, which are significantly improved from its predecessor. Everything is so colorful, varied, and detailed that it becomes impossible to look back at the first game without a scoff. It does cause some problems on older systems because of this, but the visual reward is worth the increased hardware recommendations. Otherwise, it comes back to that more word to tell you what so great about the game. That would include more power ups (that goes along with more characters), more achievements, more collectibles, more environments, and best of all more obstacles like zip lines and mine carts that help make playing “Temple Run 2” in long sessions a much greater joy thanks to some genuine variety around every bend. And of course it all works. 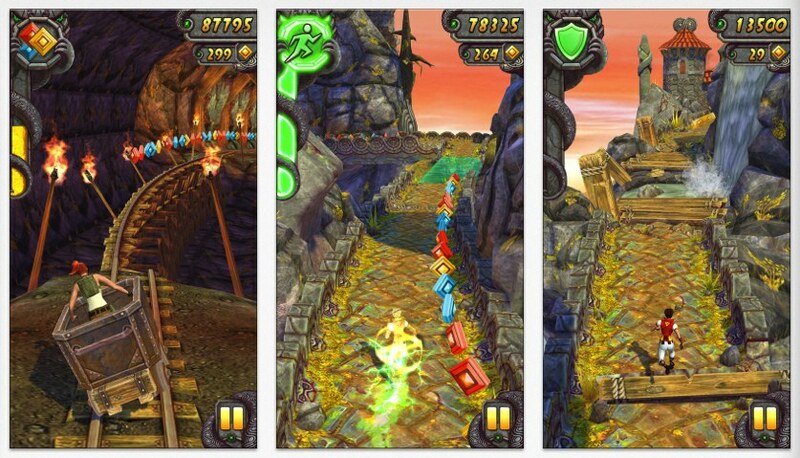 “Temple Run” only came out in 2011, and while the novelty of it has long worn off, the fun never really did. “Temple Run 2” celebrates that fact by maintaining the simple joy of the gameplay, and sacrificing none of the addictiveness, but it also knows where to nip and tuck, and where to enhance, so that at least for the first few play-throughs, the game feels new again. I think the reason that I was hesitant to write about “Temple Run 2” here is because it is such a big, bold, headline grabbing release, it seems almost lazy to join the masses of appraisers and admirers in covering it. Yet after spending some time with the game, I’m reminded that it’s not always about what’s new, what’s bold, and what’s unsung, but that rather sometimes it’s as simple as good is good. Well “Temple Run 2” is certainly good, and it’s also my app of the week.